The New Waverly Chapter Heaven’s Saints Motorcycle Ministry, is located in New Waverly Texas on I-45 about 50 miles north of Houston. We are a Ministry not a club. At the present time our main area of ministry is to take the Word of our Heavenly Father into prison with the “Fresh Consuming Fire Ministry”, “Bill Glass Ministry”, and through the State of Texas Prison system, as well as other programs and ministries. We do attend and minister at local rallies and events such as the Texas Honor Ride Benefit for Veterans. We have a booth at the annual Lone Star Rally in Galveston Texas. We have water, coffee, tracts, and Bibles available. We offer a quiet place to just sit and talk with any one of us. Anywhere we can be a help, we want to be available to those who are searching for a personal relationship with Christ. Everywhere we go we tell people that there is someone who cares about them and is there for them. We do enjoy a fellowship ride, but we always ride with a mission. We are a Brotherhood of bikers who get together to fellowship and spread the Good News of Jesus Christ. Larry Turner President – Larry is not only a capable President, he is a great asset to our chapter as Photographer and Webmaster. He is a talented musician and uses his talent as we minister in prisons, youth facilities, rallies and in churches. He is very knowledgeable in the Word and teaches a weekly Bible Class. Don Dunlap – Vice President / Chaplain – Don is committed to minister to the lost. He is a prayer warrior and never lets an opportunity to pray for someone pass. He loves the Lord and is an avid biker. Judy Lucas – Secretary & unofficial Road Captain – Judy is a founding member of the HSMM New Waverly Chapter. She has a great love for the Lord and is passionate about following His command to “Go”. She was a long time friend to Barry and Fran Mayson, HSMM’s founder. Pam Dunlap – Treasurer – Pam is a great asset to our chapter with her talent for bookkeeping. She has a great passion for motorcycles and a heart to minister. As a rider herself, she is active in participating in the local “women riders only” events. 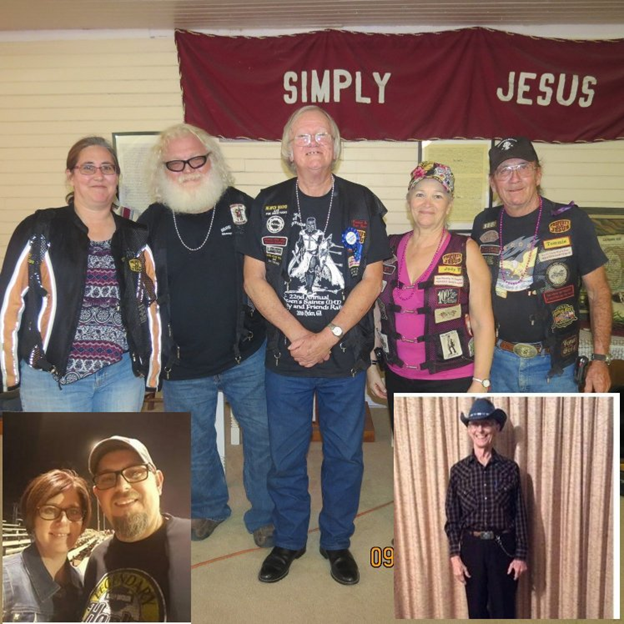 Tommie Lucas – Texas State Representative for Heaven’s Saints Motorcycle Ministry – Tommie is not only a founding member of the HSMM New Waverly Chapter. He is also Texas State Rep. He was a long time friend to Barry and Fran Mayson, HSMM’s founder. He has a deep love for the Lord and for spreading His Word.